At the end of September, the last weekend of keiryu fishing season, I went to one arm of Tadami River, one of the biggest river in Tohoku area, with Sebata-san and 2 other friends. 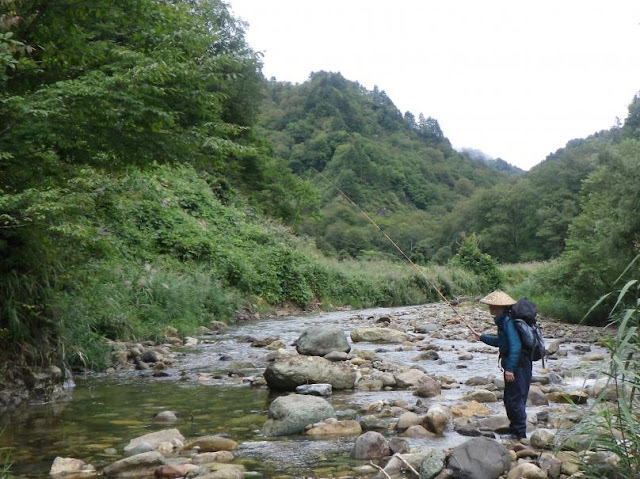 The plan was to fish iwana and yamame with wazao (Traditional bamboo rod). 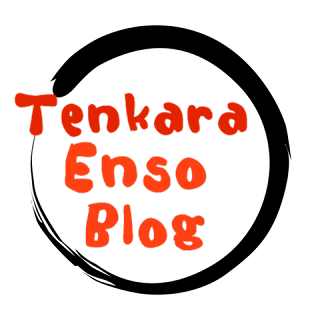 One of friends was Yamano-san who is the meister of wazao building, and another friend was Kozue-san who is the member of Tenkara lady group “Tenkara Joshi-kai”. We often see her on the headwater magazines. Nowadays carbon rods are main-stream in the most of fishing fields. 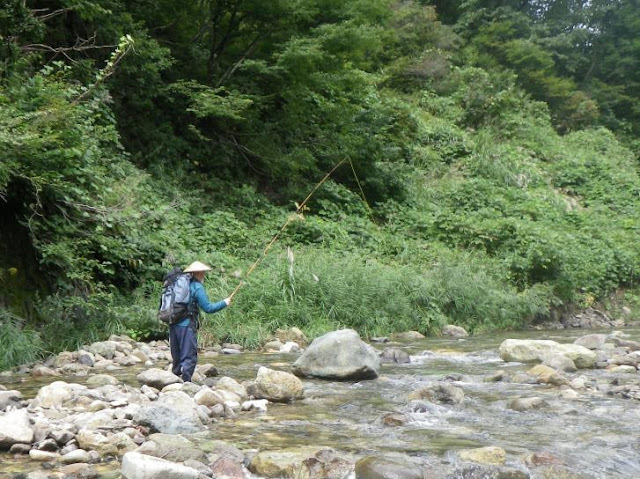 Some fishers use fiberglass rods in fly fishing but we use carbon rods more than 95% of fishing in Japan. When I was a little kid, we took up fishing with cheap and handy bamboo rods. We could buy those bamboo rods even at the grocery stores near our homes. I also started fishing with bamboo rods that were in the house. Those were the old but quite well made bamboo rods that my grandfather or father used. I was once crazy about crusian-carp fishing with those bamboo rods. It was a story more than 40 years ago. Fiberglass rods were getting quite popular for saltwater fishing, but bamboo rods were still major for Clearwater fishing then. For ayu fishing they were using 10m bamboo rods and doing fishing in the cold water without waders. It was when I was junior high school student, fiberglass rods for clear-water fishing were getting popular, and bamboo rods were disappeared from the shops very quickly, but also fiberglass rods were taken the place by carbon rods in another 10 or 15 years. Anyway we did not see traditional bamboo rods at any fishing fields for a long time, but bamboo rods were not disappeared completely. 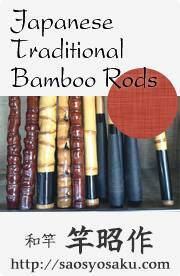 Bamboo rods have been used by some avid lovers and built by earnest artisans. 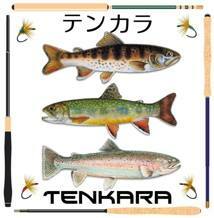 I was also thinking to own a traditional bamboo tenkara rod someday and enjoy keiryu fishing. I could never forget the memories of bamboo rods, nice fishing feeling of the rod when fighting with fish. I also thought bamboo rods fit the natural scenery of Japan. About 2 years ago, I met Yamano-san by chance and became an owner of one bamboo tenkara rod. I went fishing to my home stream right away and enjoyed fishing. Bamboo rods are heavy in comparison with carbon rods but its slow action and casting feeling is so nice. Especially the feeling when we fight with fish is superb and tasty. Once I talked with Sebata-san about bamboo rods, he said that he also had some bamboo tenkara rods. 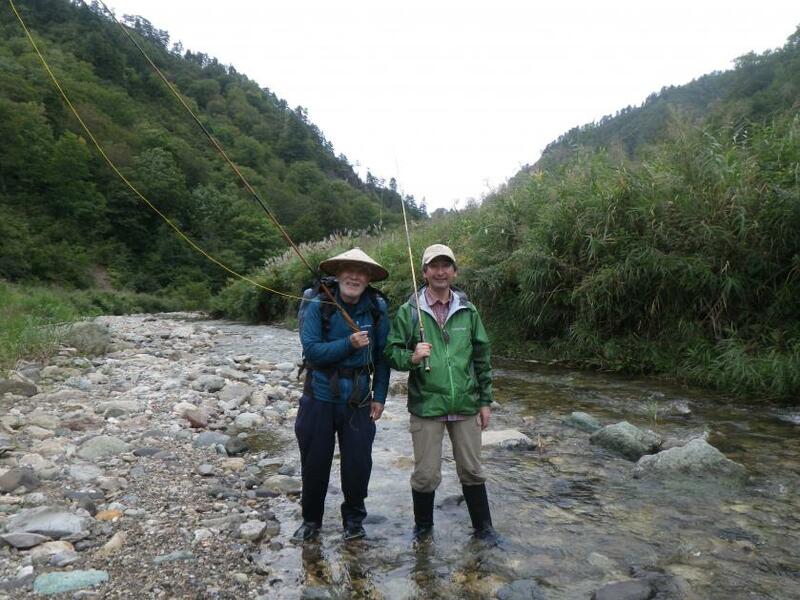 So we promised to do tenkara fishing with bamboo rods one day. Unfortunately Sebata-san had very bad backache from last summer, we did not have a chance to do that, but as he has been recovered from the backache we decided to carry out the plan at this time. On Saturday morning, we were heading to Takizawa-river by car. The stream is located about 10km down steam of Tadami-river from Bansho which is historic check point house Sebata-san was staying at. We turned into left from the main road to the narrow forest road, and we arrived at the end of the road in about 10 minutes. It was raining in the morning but the rain stopped just before we arrived there. We packed the things in backpacks and started walking into small zenmai-michi (zenmai trail).The trail went through the pleasing forest of beeches along the stream. In about 30 minutes we arrived at the riverbank of Takizawa-river by leaving the forest. 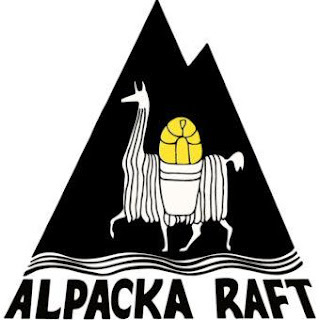 It was flat and gentle stream running through reed bed and river beech of small rocks. We prepared for fishing right away. As I was given the first cast, I cast the kebari onto the rapids by the reeds. After 2 or 3 casts, I got bite and hooked 25cm class iwana. 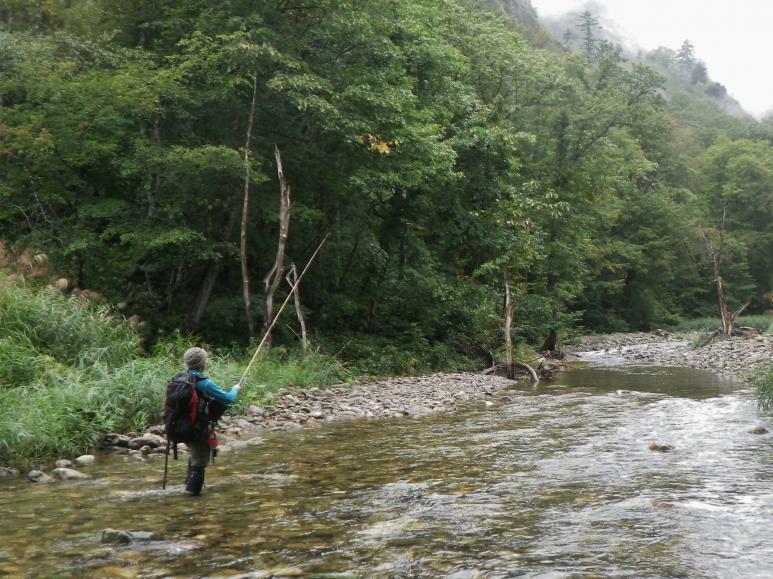 To fight with iwana got on the fast flow with bamboo rod was such a good feeling. I landed iwana and released tenderly. Next Kozue-san fished nice 28cm yamame and her bamboo rod made a beautiful arc. She was very happy because it was her first fish with bamboo rod. Soon Sebata-san started casting with his bamboo rod. His bamboo tenkara rod was about 3.2m in length and by 7 segments which is quite rare as bamboo tenkara rod. 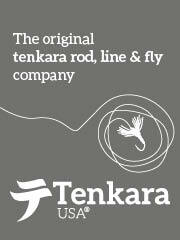 Normally bamboo tenkara rods are composed by 3 or 4 segments in length of 3.0 to 3.9m. Another point was his rod was very right as bamboo rod. I thought it must be a very expensive rod. Sebata-san’s casting was very beautiful. May be the atmosphere of Sebata-san matches old fashioned bamboo tenkara fishing very well. Heavy weight furled taper lines are good for bamboo tenkara rod, so quite heavy Sebata-line fits the bamboo tenkara rod perfectly. Soon he fished good size iwana too. Yamano-san hooked probably the biggest size yamame later but unhooked just before landing. It was so disappointing but we laughed. We enjoyed fishing alternately and waded upstream for another 2 hours. Sebata-san was fishing right upstream of us. His bamboo rod just made an arc and Sebata-line flew gracefully making a beautiful loop. The mountains behind him seemed just starting to have the coloring of autumn and the stream he was standing on was so clear. Sebata-san looked like as if he was fishing in the beautiful painting.